1) Longman & Eagle is on the left there, I actually walked right past it because there was no signage on the exterior. I think they’re working on putting up a new sign but I’m not sure. 2) The interior of the bar/restaurant. 3) The left side of the bar, which contains nothing but whiskey (it’s a whiskey bar). 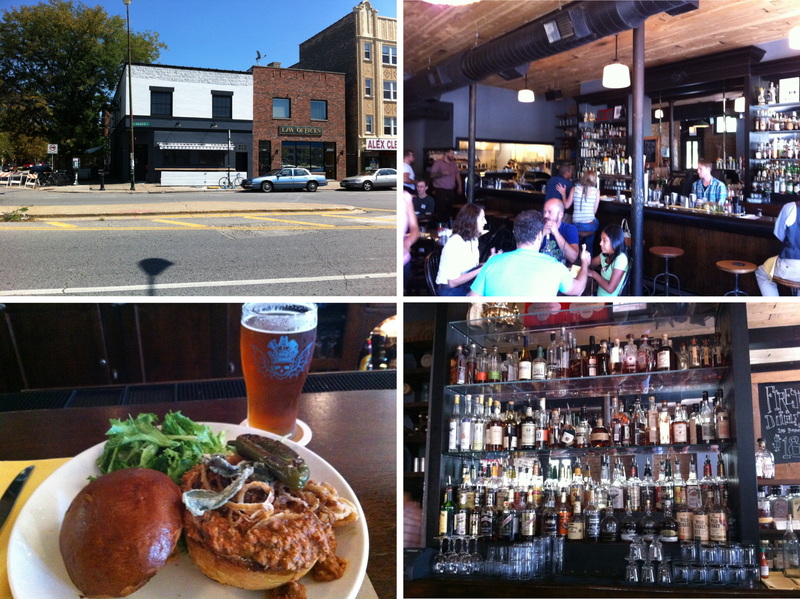 4) My lunch, I had the Wild Boar Sloppy Joe, including crisp sage and onion, and a pickled jalapeño. I didn’t eat the jalapeño whole but I did slice it up to add some spice to the sandwich. I had Three Floyds’ Pride & Joy beer, which is an American “Mild” Ale. In all it was a great lunch. I went back to Alex’s apartment and chilled for a bit before leaving for the game. I took the 74 bus at 4:35 and then jumped on the red line at Fullerton and Sheffield. Five minutes later I was at the Addison stop and outside of Wrigley Field shortly thereafter. Alex was meeting me outside of the home plate entrance and arrived 10 minutes after I got there. 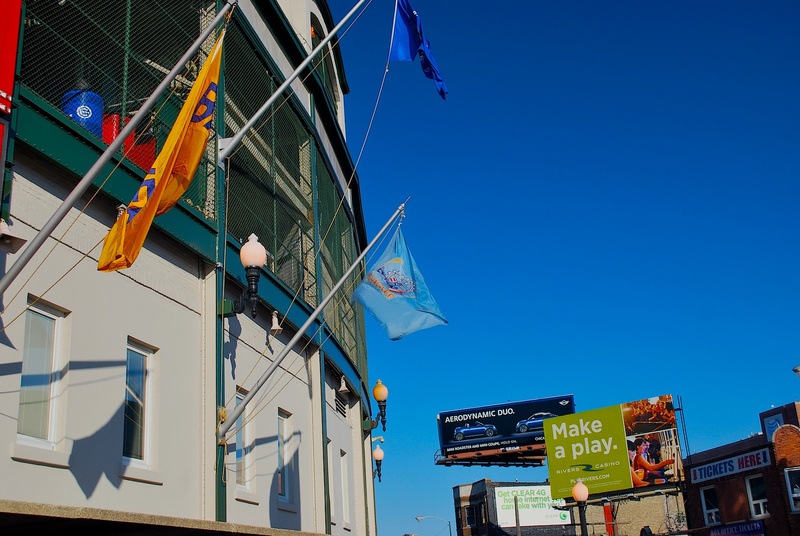 Monday was my 13th Brewers-Cubs game at Wrigley Field but the first time I noticed that the visiting team’s flags are hung to the right of the marquee. A Brewers flag is on the left, a city of Milwaukee flag on the right and the Wisconsin flag up top. Pretty cool. I feel stupid for not noticing this before but hey, better late than never. Jamie, who works in the marketing department, had reached out and invited me to be a guest on the field during batting practice. I chose Monday because I knew Alex would be with me and he would enjoy it as well. Thanks Jamie! 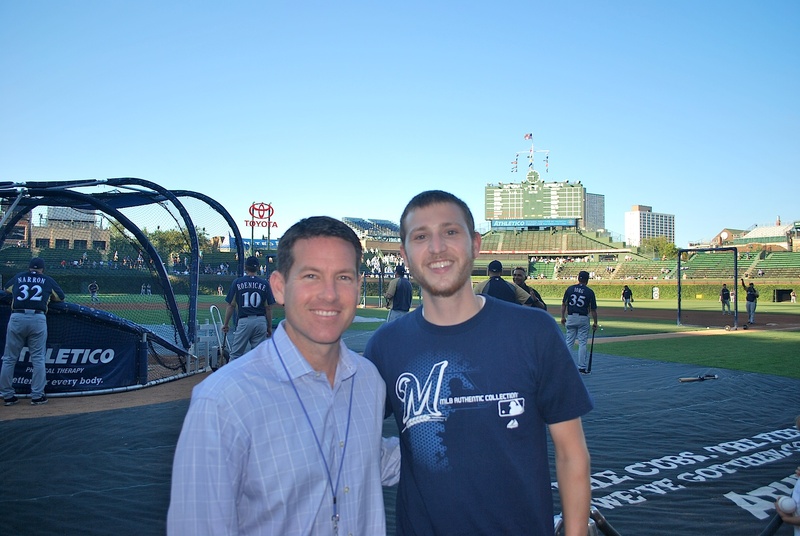 At some point Brian Anderson (the Brewers play-by-play guy for their TV broadcasts) was on the field and I introduced myself. He asked how things were going and we talked briefly. Brian is a great broadcaster and a great guy, hopefully he’ll be the announcer for years to come. Even though I had game photo number 5 taken on the field back in April when I was there, I figured I should do it again. We took an insurance picture when the batting cage was still on the field in case we were asked to leave before they were done in the cage. We were allowed to stay on the field for a few minutes after the field was cleared though and Alex took another one for good measure. It was that kind of night. I had bought tickets on the wrong side of the aisle and there were constantly vendors going up and down (it’s their job, I understand that). It seemed like there were more of them than usual though. 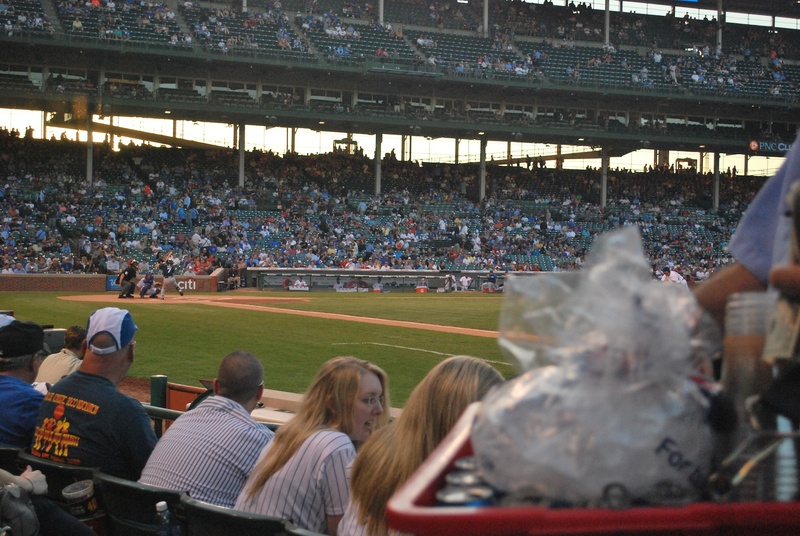 This isn’t an exaggeration; one beer vendor would be at the bottom of the steps, and less than 60 seconds later there’d be a different beer vendor slicing through an empty row to patrol the same aisle. I must’ve looked like a maniac with all the bobbing and weaving as to not miss any of the action. 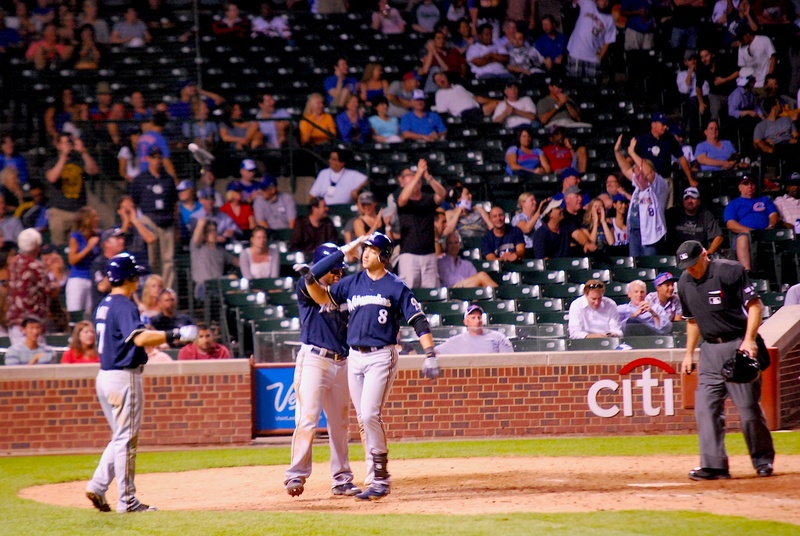 In the top of the 6th the Brewers added to their lead when Norichika Aoki drove in Gomez with a single to right. I know Aoki has been doing the finger-mustache as a sort of celebratory “beast-mode” thing with his teammates, but I’m not sure of it’s significance (or its origins). They’ve probably talked about it on the TV broadcasts but being at every game I miss out on the inside scoop sometimes (not complaining). I will say that I am looking forward to watching games on TV next season. I’ve loved (most) every minute of the season but I do enjoy watching games on TV as well. Mainly getting the view from behind the pitcher’s mound so you can see the break of pitches and especially the instant replays of controversial calls on the base paths. 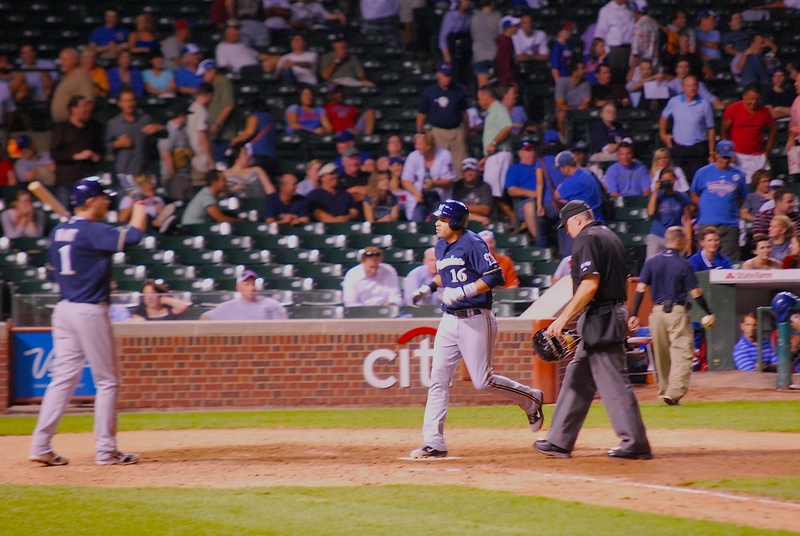 The Cubs got one back in the 6th and it was a 5-4 Brewers lead until Carlos Gomez hit a solo home run in the top of the 8th. Between the top and bottom of the 8th I had the gentleman in front of us take a picture of me and Alex. 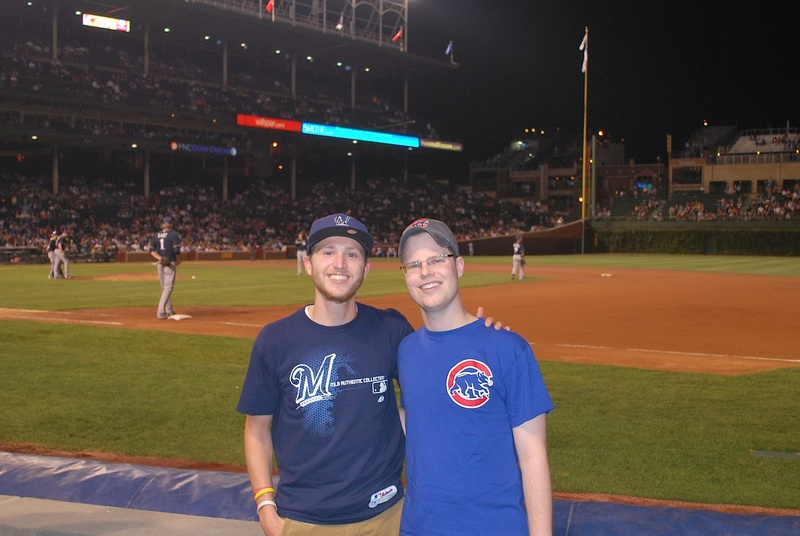 Even though Alex is a Cubs fan he was kind of hoping the game didn’t go to extras because he had an early doctor’s appointment and it was looking like we wouldn’t get back to his place until after 11:30. 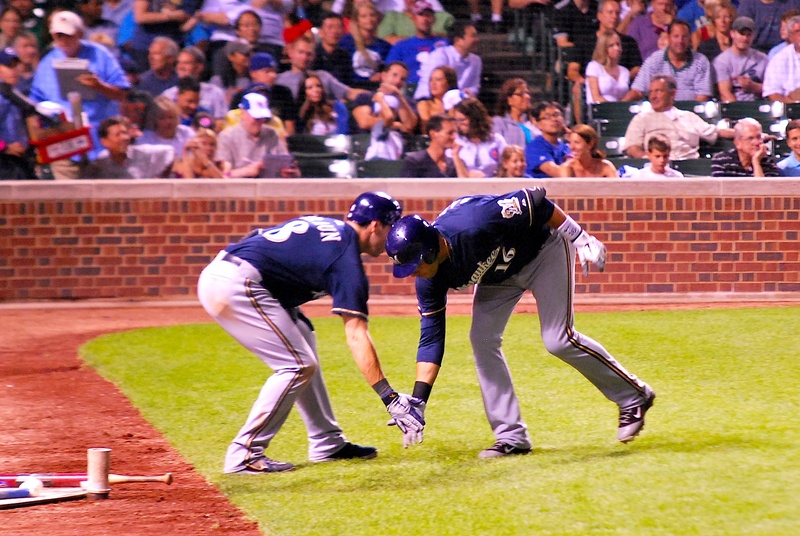 The Brewers half of the 9th may have prevented extra innings but it did him no favors in terms of shortening the game. Aoki walked to lead off the top of the 9th and Weeks singled. 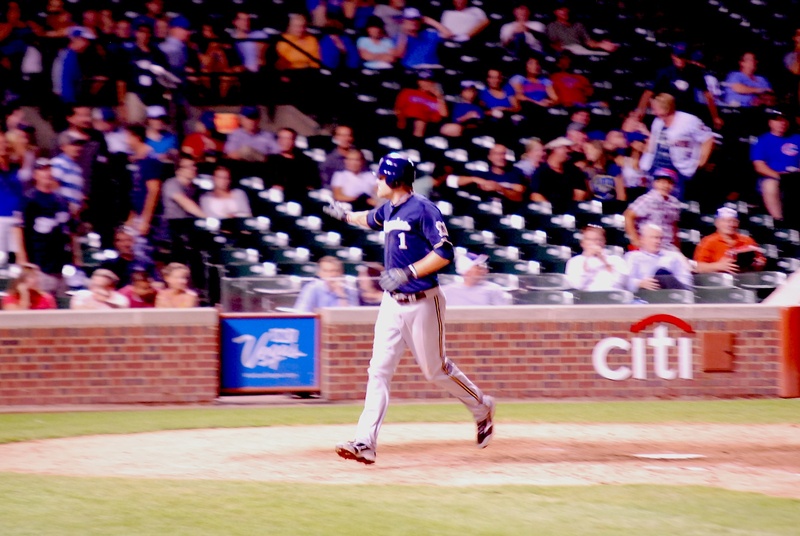 After the 1-0 pitch to Braun three of the next ten pitched resulted in home runs for the Brewers. Braun, Ramirez and Hart went back-to-back-to-back and the Brewers took an 11-4 lead. After Braun’s home run I got a bunch of tweets from people joking about it being “an absolute bomb” and a good time was had by all. I looked this morning and hit tracker online lists it as a 404 foot home run. I couldn’t see where it landed since it went out onto Waveland Avenue but I thought it was hit farther than that. After Hart’s home run Sveum brought in somebody new from the pen. They didn’t fare much better and gave up a walk and two singles before getting the first out of the inning. Only one run would’ve scored on the second single but a throwing error allowed the second baserunner to score as well. 13-4 Brewers. 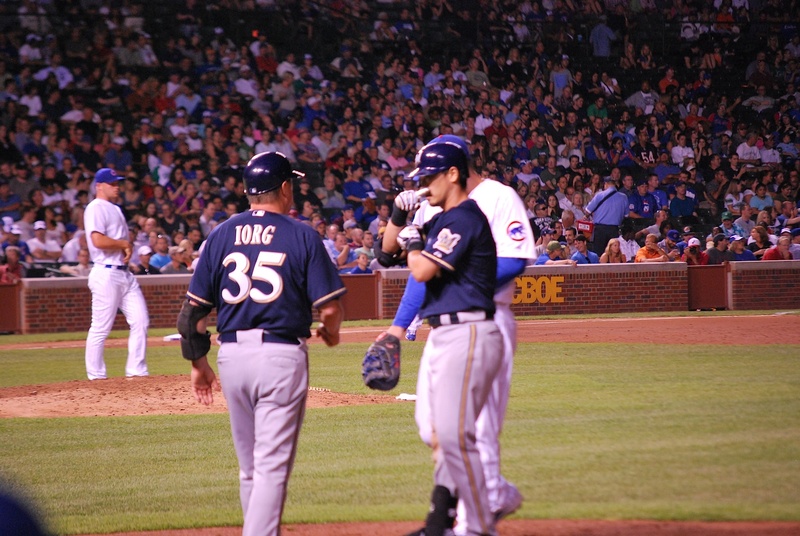 After an Aoki walk and a Weeks strike out Braun singled to drive in Segura. 14-4 Brewers. 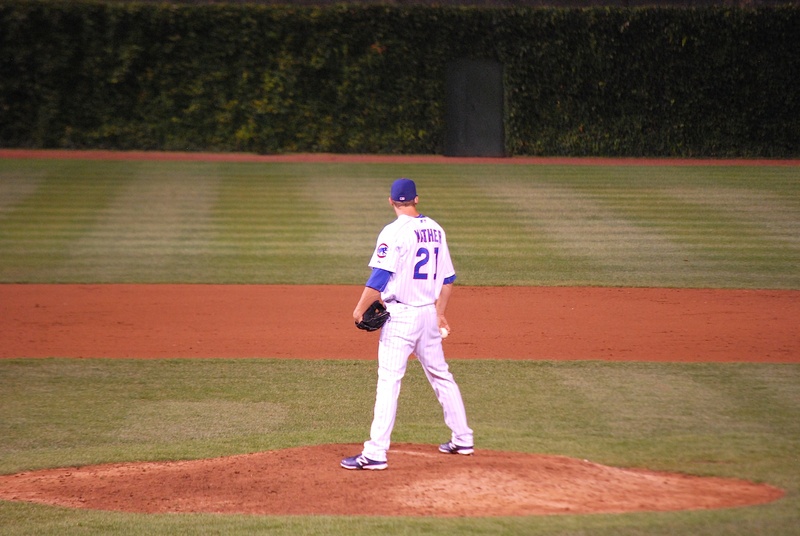 Another pitching change took place and Sveum opted for utility man Joe Mather. In blowouts teams will sometimes use position players to pitch in order to save the bullpen from more work. Mather had pitched once before in 2010 as a Cardinal. It wasn’t his debut on the mound but it was still cool to see. Mather gave up an RBI single to Bianchi but then got Maldonado to ground into a force out and the marathon half-inning was over. 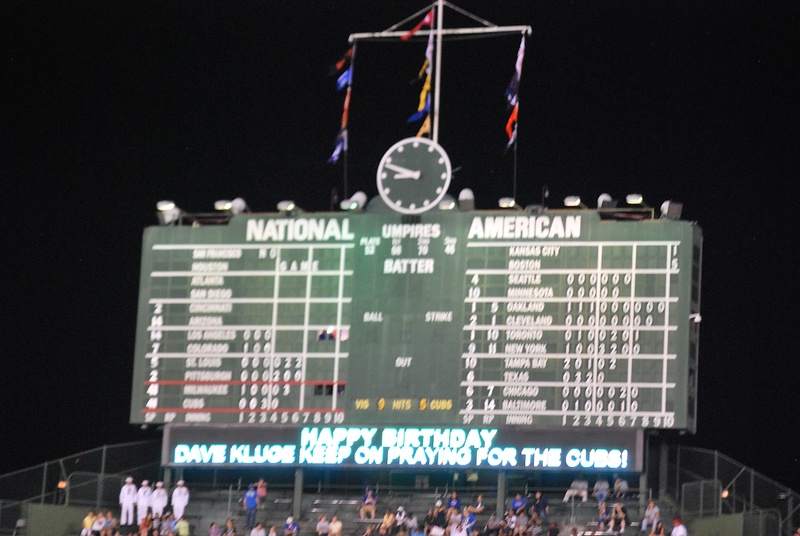 14 batters, 54 pitches, and roughly 35 minutes later the 9-run half inning came to a close. 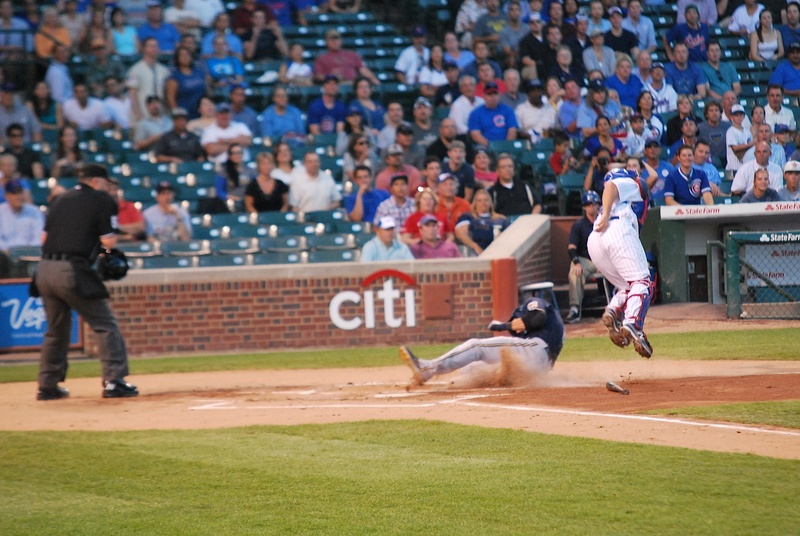 The Cubs went down 1-2-3 in their half of the 9th and the Brewers picked up the W. Final Score: Brewers 15 – Cubs 4. 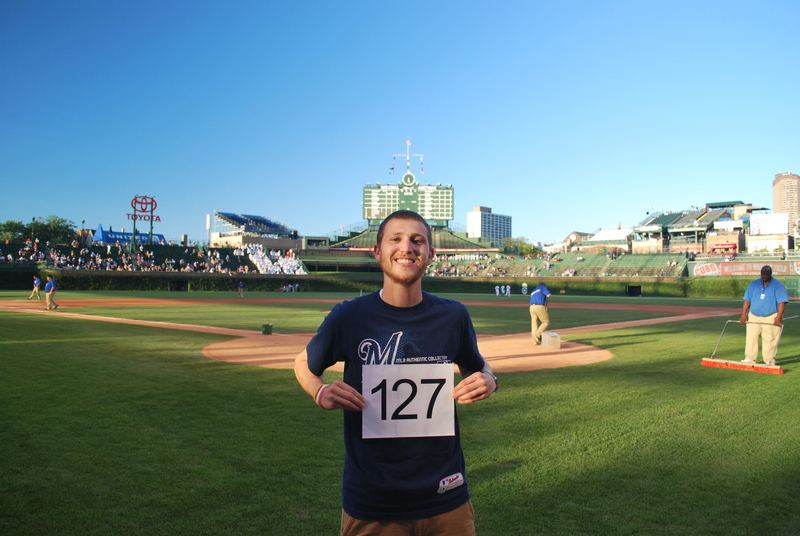 I raced down to the dugout after the game because I wanted to try and get the lineup card. A kid must’ve asked for it ahead of time because even before the coaches returned to the dugout after the post-game handshakes he had it in his hands. Darn. I think getting a lineup card would be sweet, but you have to be at the dugout right after the game and it’s not always easy to get there in a timely manner. It’s almost noon on Tuesday and I’ll be leaving for downtown shortly. Eliza, my sister, is staying in Chicago for the time being and I’m meeting up with her for lunch. We’re hanging out for a bit and then she’s joining me for tonight’s game. It’s her first game at Wrigley and it should be a good time.